Different people like different foods and like to prepare the same foods in different ways. Culture, family back-ground, religion, moral beliefs, the cost and availability of food, life experiences, food intolerance's, and allergies affect people’s food choices. Use the Food Guide Pyramid as a starting point to shape your eating pattern. It provides a good guide to make sure you get enough nutrients. Make choices from each major group in the Food Guide Pyramid, and combine them however you like. For example, those who like Mexican cuisine might choose tortillas from the grains group and beans from the meat and beans group, while those who eat Asian food might choose rice from the grains group and tofu from the meat and beans group. However, if you usually avoid all foods from one or two of the food groups, be sure to get enough nutrients from other food groups. 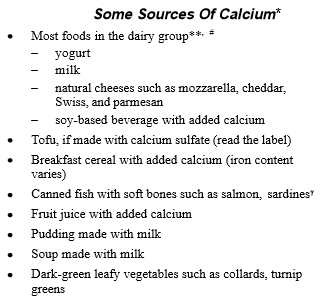 For example, if you choose not to eat dairy products because of intolerance to lactose or for other reasons, choose other foods that are good sources of calcium (see picture below), and be sure to get enough vitamin D. If you choose to avoid all or most animal products, be sure to get enough iron, vitamin B12, calcium, and zinc. Growing children, teenagers, women, and older adults have higher needs for some nutrients. Adolescents and adults over age 50 have an especially high need for calcium, but most people need to eat plenty of good sources of calcium for healthy bones throughout life. When selecting dairy products to get enough calcium, choose those that are low in fat or fat free to avoid getting too much saturated fat. 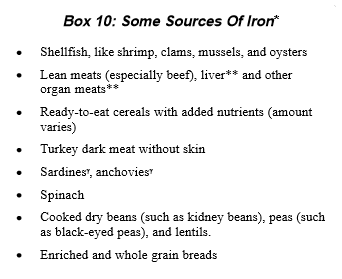 Young children, teenage girls, and women of childbearing age need enough good sources of iron, such as lean meats and cereals with added nutrients, to keep up their iron stores (see picture below). Women who could become pregnant need extra folic acid, and older adults need extra vitamin D.